Penn Medicine Nudge Unit Chief Mitesh Patel, who has previously made international headlines with his fitness tracker research, is featured in a new Popular Science magazine article about Google's new "heart points" Android and Apple mobile apps. 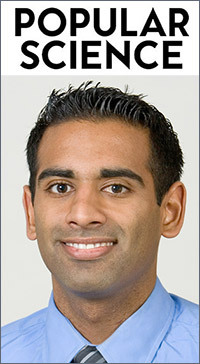 An Assistant Professor at the University of Pennsylvania Perelman School of Medicine, and a Senior Fellow at the Leonard Davis Institute of Health Economics (LDI) Patel, MD, MBA, has previously generated international headlines with his research related to the accuracy and medical efficacy of fitness trackers. The print edition of Popular Science circulates to 6,475,000 readers in more than three dozen countries; the website logs 14,156,742 page views monthly. The September Popular Science piece looks at Google's overhaul of its mobile device health tracking systems and launch of the new Google Fit for Android and Wear OS for iPhone. The innovative new systems generate metrics in "move minutes" and "heart points." Both OS versions extract gathered biometric data from digital watches and other wearable devices and feed it to the phone apps. The functions and interpretations of the new Google wearables were established in collaboration with the American Health Association and the World Health Organization in an effort, Popular Science reports, "to bring in-app goals into better alignment with peer-reviewed research on healthy behaviors—and make that data comprehensible to the average user." In a departure from previous standards that sought to motivate users to walk specific numbers of steps or exercise for a specific number of minutes, the new "move minutes" and "heart points" metrics are designed to measure essentially any movement and report on it in the context of overall movement. They measure any activity of the wearer in terms of its intensity, awarding "heart points" for the level of vigor involved. However, Popular Science writer Eleanor Cummins notes that despite the widespread hype about health fitness apps during the first generations of device apps like Fitbit, there is only ambiguous evidence that the possession of such products ultimately results in weight loss or better health -- because owning a digital device is not the same as being highly motivated to exercise on a regular basis. "What we’ve generally found is that just giving a wearable by itself is not going to help the average person to be more healthy," Patel told the magazine. "For the average person, the wearable will give them a sense of how active they are, but it’s not going to motivate them." Patel explained that some research studies have found that wearables can assist people in losing weight; other studies have found the opposite. The Popular Science article notes that "some surprising studies suggest wearables may even hinder weight loss: In 2016, researchers tracked 470 adults, divided into two groups, for two years. Every participant was on similar diets, received group counseling, text-message prompts, and were told to exercise more. But only one of the groups had a wearable device. Those without the wearable lost 13 pounds on average—and those with it lost just 7.7 pounds, according to the results published in the Journal of the American Medical Association in 2016."